Disclosure: This is a sponsored post in which i was sent a review copy of the book as well as compensated for my time in sharing my thoughts and promoting my post through my social media channels. However, all views shared are mine and mine alone. Chuck Yeager Goes Supersonic is a wonderful story about a true American hero. You can learn more about the book and the author here: http://www.supersonicflyer.com. You may recall me mentioning a short time ago that we decided to homeschool Savannah this year for Kindergarten. Well, so far, so go. Yes, it is a lot of work to plan the week's worth of school work as well as make a point to attend meet ups and other homeschool groups and field trips for socialization, but Savannah is really enjoying it and learning so much. And, I love watching her get excited about things that she is learning and ask more in depth questions about things. Not being that familiar with planes, I knew I would have to research more so that I could properly answer Savannah's questions. My search about planes geared towards young children led me to look for children's aircraft books to share with her. If you have done a search for aircraft books for kids, then you probably know that there are not that many out there. And, the ones that I found, I knew that they would not keep Savannah's attention. 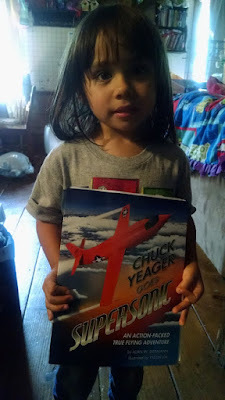 Thanks to a blogging book review opportunity that came a few days later, I was given the opportunity to review a book called "Chuck Yeager Goes Supersonic." When I read the press release about this book it was like this book was being published just for us, to answer our aircraft questions. But, after having an opportunity to interview the Author, Alan W. Biermann, I found out that he wrote this book as he struggled to find a similar book for his son. 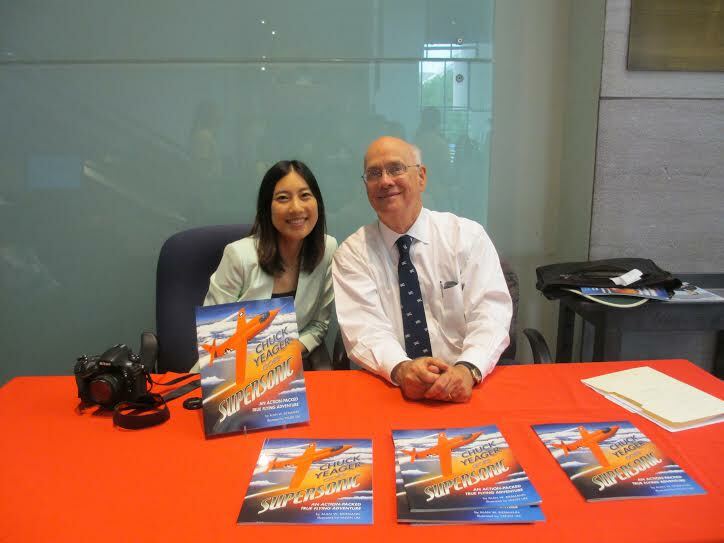 Alan W. Biermann and Yaejin Lim (the book's illustrator) at the table at Smithsonian near the bookstore ready to sign books. As soon as Savannah saw me take the book out of the mail, the orange aircraft on the front cover caught her eye, and she couldn't wait to sit down and have me read the book to her. It wasn't until we sat down that we realized that this would be able to answer to most of Savannah's questions, including a whole chapter on sound and the sound barrier. "Alan Biermann's father was in the airplane propeller business and he was around airplanes a lot in his early years. When he was in high school and college, he spent most summers working in the propeller factory assembling propellers for single and twin engine airplanes. He became a sailplane pilot in college and eventually flew many flights at El Mirage dry lake bed on the Mojave Desert near where Captain Yeager (now General Yeager) flew many of his record breaking flights. 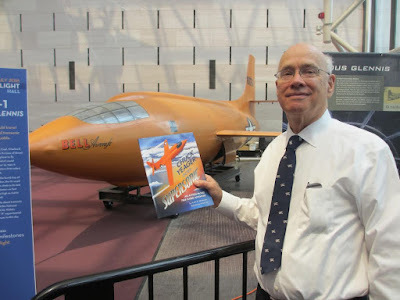 The story of the breaking of the sound barrier has been one of his favorites for his whole life and he is now enjoying getting it out to the young people of the world. He was a professor of computer science at Duke University for most of his career. His research area was artificial intelligence and he received grants and published many papers in this field. He also wrote a general textbook in computer science entitled Great Ideas in Computer Science which was published by The MIT Press in 1990, 1997, and a third edition, with coauthor, Dietolf Ramm, in 2002. Professor Biermann is a Fellow in the Association for Advancement of Artificial Intelligence and in the Association for Computing Machinery and a past President of the Association for Computational Linguistics." o Tell me about your book. How did you come up with that (story, angle, idea)? Do you have any favorite authors or favorite books? Alan: I am so excited to be getting the word out on my book, Chuck Yeager Goes Supersonic. I assume that you have a copy. I tell in there in my personal story at the end about growing up around airplanes with my dad in the propeller business. When my son was young, ages 3, 4, 5, etc. I read him a million stories. Since I had an interest in aviation, I tried to find books about flying to read him and I found almost none. Finally, I started reading adult books to him when he was maybe five or six. 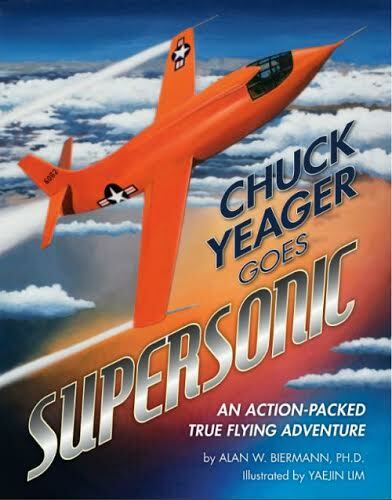 At some point I ran into the Chuck Yeager autobiography and he and I just loved this story. I read some of the hot parts to him several times. I suggest that you will be astounded at what a great book this is if you have not read it. But I could not find many real life action stories like this for my son in children's books and I looked and looked. I found the Wright brothers story and not much else. I kept thinking that books like this are badly needed. But I was a professor of computer science at Duke University and working very long hours. I could not do any writing at that time. But maybe someday . . . . Here is an interesting interlude: I have a granddaughter who read books with huge enthusiasm from the earliest age. When she got to seven, she ran across a book about the Titanic and became totally gripped by the story. She read the book again and again and then her mom found more books about the Titanic. She read them all and then she read them again. Her mom took her to a museum and they saw artifacts from the Titanic. She is now an expert on the subject. The point of this is that it was a TRUE story of terror and heroism. Almost all of the books available to her are fiction and the fact that this was true meant so much to her. I think that kids will become very excited about TRUE stories when they get a chance at them. o How did you get interested in writing this particular genre? Alan: After I retired a few years ago, I decided to think about how to deliver a great story of true adventure to little children. I joined the Society of Children's Book Writers and Illustrators and began taking them early versions of my proposed Chuck Yeager manuscript. They shook their fingers at me and told me what I needed to do and what to avoid. Then I took another version and another and finally I started sending it to publishers. They said they were not publishing that kind of book which I agreed with. So I started looking for an artist to do the pictures. That was a very long story but I finally found in Pasadena, California the most incredible brilliant wonderful artist that I could imagine,Yaejin Lim. Then I found Julia Gignoux, a book designer in Vermont and we put the book together over a period of about two years. Then she took it to CreateSpace and I self-published the book. It is available at Amazon.com and at bookstores that are interested in carrying it. When I take it to schools and talk to kids, they go wild over it. A kid stopped me at a party a few days ago and explained to me that he had read it again and again and loved it so much. Many parents have thanked me so earnestly for explaining the sound barrier so that they can understand it and talk to their kids about it. o What is the hardest part of writing for you? Alan: I have written another true aviation book for children and would love to go forward with the artistry and book creation. Both my artist and my book designer have expressed their delight at the possibility of doing the next book. o What's a typical working day like for you? When and where do you write? Do you set a daily writing goal? Alan: I have other projects that I am doing so I am busy but not necessarily on writing. I am still going to my office at Duke, meeting with faculty, going to technical talks, and keeping up with computer science. My wife and I take care of our two granddaughters, ages 5 and 10, two days each week. Occasionally, I get invited to give a presentation about my book or I go somewhere and meet people and talk about it. In the next few weeks, I will probably return again to Fayetteville, North Carolina where there is a large military base and lots of military families with interests in aviation. I visit schools, libraries, and bookstores there. o What’s the best thing about being an author? Alan: I am so gratified at the responses that people have given me over this book. I feel it has the possibility of being known in every household in America. But it has a very long way to go. The kids love airplanes to this one would be a huge hit in our house. This looks like a good book for my nephew. He loves airplanes too.